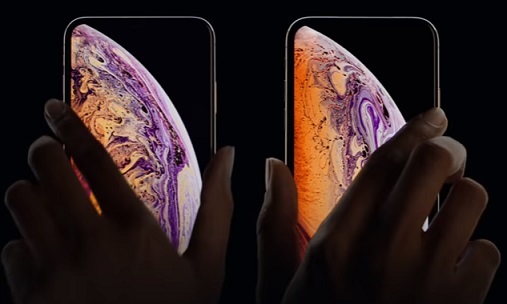 After releasing the video presentation for its three new devices (iPhone XS, iPhone XS Max, and iPhone XR), on September 12, Apple has released a series of spots focused on the specific features of the iPhone XS and XS Max. One of them, titled “Illusion,” showcases the two smartphones with focus on their design. An onscreen line welcomes viewers to the big screens, while a woman is holding the devices in ways to allow people get an overview through comparison. The soundtrack music is the 2017 single “Nothing Burns Like The Cold” (feat. Vince Staples) by Swedish R&B singer and songwriter Snoh Aalegra. developed stainless steel, which is precisely machined to create structural bands in three finishes, including new gold, water and dust resistance, and “the most durable glass ever developed for a smartphone.” The Face ID, enabled by the TrueDepth camera system, the A12 Bionic, the smartest and most powerful chip ever in a smartphone, the breakthrough camera system with Portrait mode and new software-enhanced, adjustable depth of field, 4K video with better low-light performance are also among the key features of Apple’s new smartphones. The iPhone XS is now available to pre-order in most countries around the world, with the handset going on sale globally from September 21. In terms of price, the 64GB iPhone XS is retailing at $999 / £999 / AU$1,629, the 256GB iPhone XS at $1,149 / £1,149 / AU$1,879, and the 512GB iPhone XS at $1,349 / £1,349 / AU$2,199.